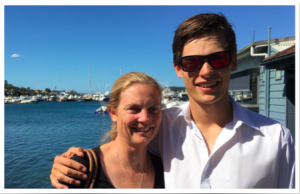 Personal Training in a Mother and Son Partnership: the perfect gym buddy! Longevity clients Meredyth and Hamish Grogan share paired sessions in the gym. Their Personal Trainer, Nicola, caught up with Meredyth this week to ask a few questions about the mother and son training experience. Who’s idea was it to spend some Mum and Son time in the gym? It was Hamish’s idea when he was only 14 to start joining me in sessions with Jarrat after I started at Longevity. When we first started I was proudly the strongest & fittest but very quickly lost that status as he grew about 10cm and got into his weights. I can never open any jars he has closed at home now! Hamish is really the motivator in our family. We’re actually quite competitive if we’re doing side by side cardio which is fun. He’s also steering us into better eating habits at home as he focuses on his meals for building his strength and body in a healthy way. And the benefits of training together? It is a really nice way to enjoy our relationship & time together on another level especially as he has moved into his last couple of years at school. Mums are some of the busiest people going around, juggling full time work, kids and a social life. It’s no wonder that many mothers tend to neglect their own health and fitness! Here at Longevity, the team has come up with a simple exercise program that every mum, no matter where you work or what you do, can squeeze into their day to ensure that their health becomes a priority. Rest for 2 mins and repeat 3 times! Something to be mindful of this mother’s day is that inactive older women are at a high risk of developing osteoporosis, a degenerative skeletal disease where the bone loses density and becomes susceptible to fractures. In fact, the American National Osteoporosis Foundation estimates that 50% of women aged 50 years and older will break a bone due to osteoporosis. This is particularly frightening considering that a woman aged 50 years or older is 8 times more likely to die in the 3 months following a hip fracture, compared to a woman who has not sustained a fracture (http://www.medscape.com/viewarticle/729944). Keeping in mind that inactivity is a key cause of osteoporosis, it is recommended that guidance from a qualified exercise professional is sought to prescribe specific exercise for osteoporosis. Longevity Personal Trainer, Rachel, has a number of clients she sees weekly for osteoporosis and osteopenia. The key feature of her exercise prescription to prevent and manage osteoporosis in her clients is regular weight bearing movements, starting with a basic but very functional squat and step up. A study conducted by the American Journal of Preventative Medicine in 2015 found that women who performed 150 minutes of moderate walking per week not only increased their physical health but also improve their emotional and mental wellbeing, were socially connected and even decreased symptoms of depression and anxiety. LADIES! How many of you are currently feeling overwhelmed by any of these symptoms? Hot flushes, weight gain, insomnia, headaches, night sweats, fatigue or mood fluctuations? You are not alone! Therefore, this is a crucial time for you to be exercising! Exercise can preserve your muscle and bone mass, assist with weight management, increase cardiovascular fitness and strength, improve balance & flexibility, improve self-esteem and mental health and reduce the risk of associated conditions such as dementia and metabolic syndrome. Consult an exercise professional who understands the changes your body is going through and can prescribe exercise appropriately including higher impact and resistance training which the research shows is the most beneficial for maintaining bone mineral density. Find a training buddy or new group class, which will increase your adherence and provide you with the support to continue exercise. Tell others about your health journey! Put your goals up on the fridge or bathroom mirror, somewhere you will see them daily. Reward yourself healthily for achieving health and fitness milestones – buy yourself a new sports top, book a massage or have a night away. That’s $110 down to $55. Email info@longevitypt.com.au or call 1300 964 002 to purchase your Gift Card for Mum. If you are looking to start personal training and exercise physiology in Sydney, we are more than eager here at Longevity PT to get you started! Our team of personal trainers and exercise physiologists are ready to give you the best tailored exercise program to achieve your very personal goals. Partnered with quality health professionals in Sydney suburbs such as Edgecliff, Double Bay, Bondi, Bondi Junction, Woollahra, Killara, Roseville, Gordon and Lindfield we are looking forward to giving you the best shot at achieving your health goals, whether it’s weight loss, energy or muscular strength training. Don’t hesitate, book in today!